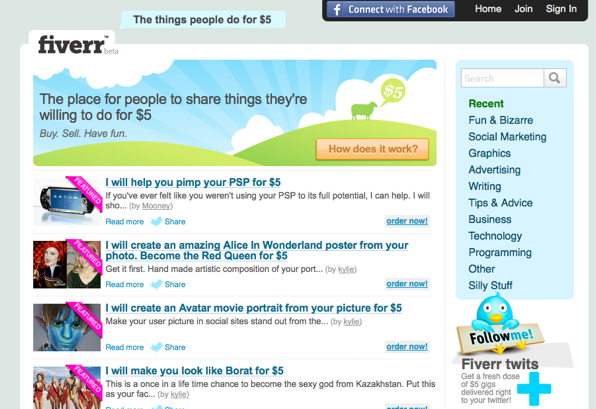 Fiverr is a marketplace for gigs that are priced at $5. Essentially, you can sell and buy tasks for $5. So anyone can create a gig for small service on the site, and visitors can accept gigs as well. Gig prices are fixed at $5. Buyers can order gigs and are required to pay for the gig in advance. Fiverr takes $1 off of the $5 fee. Gigs range from installing WordPress on a server to reading Tarot cards to writing a romantic sonnet. Tasks are divided into categories, including Funny and Bizarre, Social Marketing, Graphics, Writing,Technology, Business, Silly Stuff and Programming. The idea is kind of brilliant and also entertaining. While you don’t necessarily have assurance that your task will be completed to your standards, you are only shelling out $5 for the task, so it’s not a total loss if the gig falls through or isn’t done well. Fiverr will also post buyer feedback on people who perform tasks. Task performers will be given a positive feedback score, which can be seen by users who are considering hiring them for gigs.